A real straight forward looking hole where you can see the green from the tee, but its simplicity stops there. A large tree on the left and smaller trees and a water hazard on the right create a fairly tight funnel through which the tee shot must be hit. A bunker of the right to catch the wayward tee shot with anything hit inaccurately but long left or right finding the respective trees, invariably from which there is only one way out, sideways. The approach shot requires precision if it to hit the green. 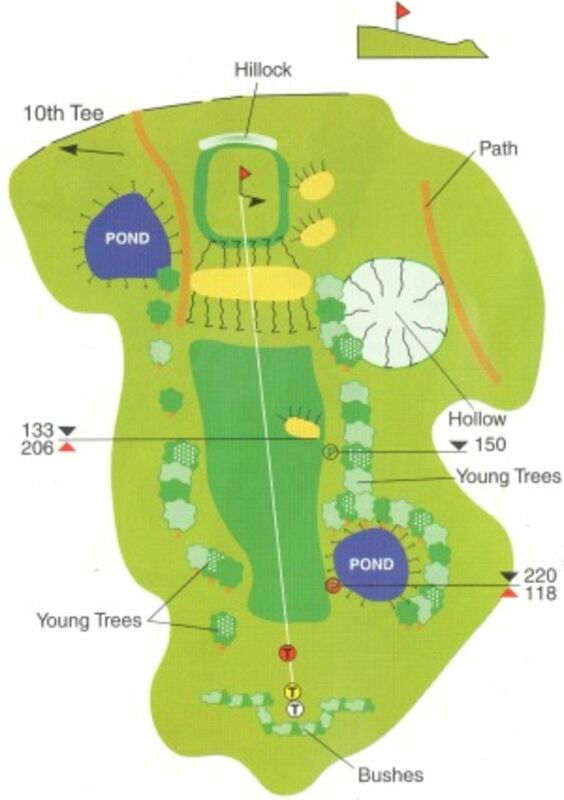 A large cross bunker will collect anything short, a pond and large beech tree will catch anything left, with two greenside bunkers waiting for the shot hit right. Short and right and you are in the deep trouble with a large hollow flanked on the fairway and green side with some very obstructive trees. The green is long and narrow with a slope from front to back. A large mound to the rear protects some balls from rolling out of bounds, but not all. Depending on the pin position, and there are very few that offer straight forward putts, birdie putts are hard to come by.